MIAMI, Fla. – Guests seeking more than just a trip to the beach can experience the ultimate adventure at Hilton Los Cabos Beach & Golf Resort. The beachfront Los Cabos resort welcomes guests to an unforgettable whale watching experience. Now through April 15, 2011, thrill seekers who book a stay at Hilton Los Cabos Beach & Golf Resort can earn a 30% pre-arrival discount on a Whale Photo Safari with Cabo Adventures. The 2.5 hour tour delivers close up interaction with these amazing sea mammals on an all-weather inflatable speed boat. Marine mammal behavior experts who are passionate about protecting wildlife guide the way while providing tips to take the most memorable photos of the majestic humpback whales. The tour is completed with an on board hydrophone to hear the soothing sounds of whale communication. Guests can also observe these sea creatures from the comfort of their ocean-view room, all restaurants and luxurious infinity edge swimming pool. Hilton Los Cabos Beach & Golf Resort room rates start at just $199 per night. Whale Photo Safari rates start at $59.00 per adult and $42.00 per child when booked in advance with the resort’s concierge prior to arrival. For room reservations, visit http://www.hiltonloscabos.com. To reserve the Whale Photo Safari, email the resort’s Gold Key Concierge at enjoy.loscabos@hilton.com. Terms & Conditions: Room rate is a starting rate, does not include taxes and services, and is subject to availability. Whale Photo Safari is subject to availability. 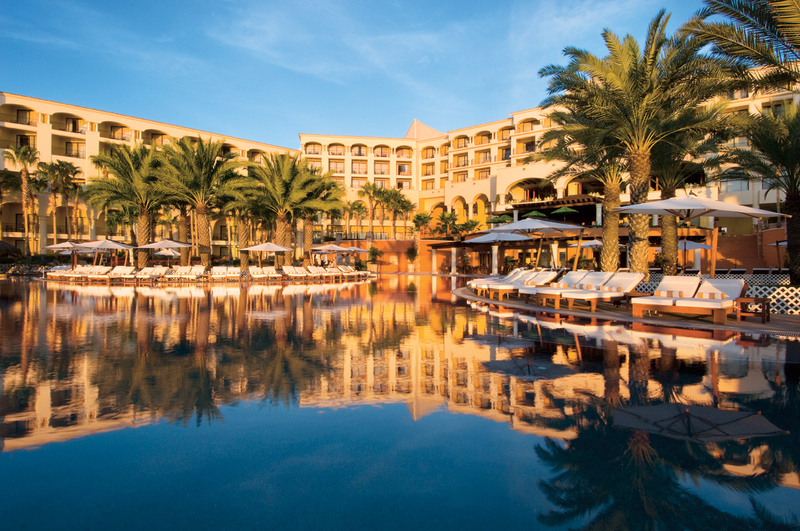 Reduced rate is only available to Hilton Los Cabos Beach & Golf Resort guests who have already booked their stay. Guest must reserve through Hilton Los Cabos Beach & Golf Resort Concierge before arrival. Available December 15, 2010 to April 15, 2011 & booking dates are October 1, 2010 to April 1, 2011. Minimum age is 8 years. No pregnant guests or guests with back problems permitted. Other restrictions apply. Ideally set along the destination’s most tranquil stretch of golden beach, the AAA Four-Diamond Award winning Hilton Los Cabos Beach & Golf Resort boasts 375 spacious and elegantly designed ocean-view guestrooms with private balcony. All rooms feature high-speed wireless Internet access, mini-bar, in-room safe and LCD television. Five dining outlets and 24-hour room service make choices seem limitless. Recreation options feature a fitness center with equipment by Precor, two lit tennis courts, two pools with swim up bars, a Jacuzzi, complimentary yoga classes, as well as a pool concierge available to provide moist hand towels, Ipods, books, magazines and games. The Hilton Los Cabos Beach & Golf Resort also features the one of the only swimmer-friendly beaches on the tourist corridor, as well as a world-class 7,000 square foot spa, with 13 treatment rooms, and an 18-hole championship golf course. Outdoor activities include snorkeling, kayaking, wave runners and more. Children ages four to 18 can enjoy the resort’s Cabo Kids Club featuring age-specific activities, arts and crafts, games and a professional staff. Hilton Hotels & Resorts is the stylish, forward-thinking global leader of hospitality that welcomes guests in more countries than any other full-service hotel brand. The Hilton brand currently includes more than 530 hotels and resorts in 76 countries, and plans to serve travelers in 80 countries by the end of 2011. By offering innovative products, services and amenities, Hilton Hotels & Resorts enables travelers to be at their best 24/7, whether traveling for business or leisure. Start your journey at www.hilton.com. Hilton Hotels & Resorts is one of Hilton Worldwide’s ten market-leading brands.